Online Registration for the AMTA 2019 Schools Summit Closes February 7th! There are only a couple days left to register for the AMTA 2019 Schools Summit, taking place February 21-22 in Charlotte, North Carolina. 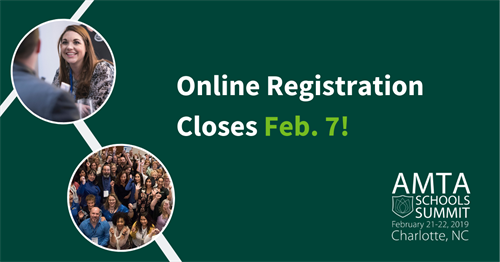 The deadline for online registration closes February 7, so be sure to reserve now. The AMTA Schools Summit, held annually, provides massage therapy school teachers and administrators with the opportunity to come together for two days of learning and networking. This is the largest gathering of its kind in the country. Attendees come from all over to learn and meet others just like them working in the field of massage therapy. If you’re looking for the chance to expand your network and gain new skills to help you and your school succeed, this event is for you. We hope to see you there! Looking for more information on AMTA 2019 Schools Summit?